I recently visited Ocean City NJ with my husband (he is from the area) for some family business and we decided to take a much-needed, decompressing trip down to the Jersey Shore. I love the sights, sounds, smells and best of all, the food…but being much more health conscious these days, shore food isn’t quite on my everyday healthy menu. I was stranded in a sea of delicious cheesy topped pizzas (yeah, not so great when you’re lactose intolerant!) and fountains of fabulous fried foods until I, to my surprise, stumbled upon the miraculous little piece of paradise: Pure Tacos. At first I was a little skeptical…”hmm, tacos…” I pondered. But upon reading the menu I realized quickly that this restaurant had TRUE vegetarian dishes that I could enjoy – not just the ever-so-exhausted and boring side of roast vegetables or the blah fruit cup. 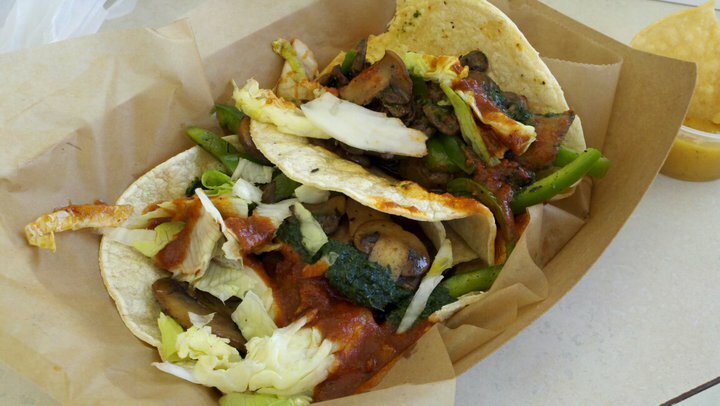 It was REAL soft tacos with fillings like seared mushrooms and peppers and savory black beans. The salsas, however, ohhh the salsas! I immediately opted for the Orange Peach Habanero to go with my side of nachos. I love sweet and spicy – especially habanero peppers. The tacos themselves were dressed with the Cilantro Jalapeno salsa…and my love for cilantro probably tops my love for, well, designer handbags. Another wonderful feature of this restaurant is that it is 100% gluten free – there is no gluten behind the counter at all, so highly sensitive Celiacs don’t have to worry about cross-contamination. 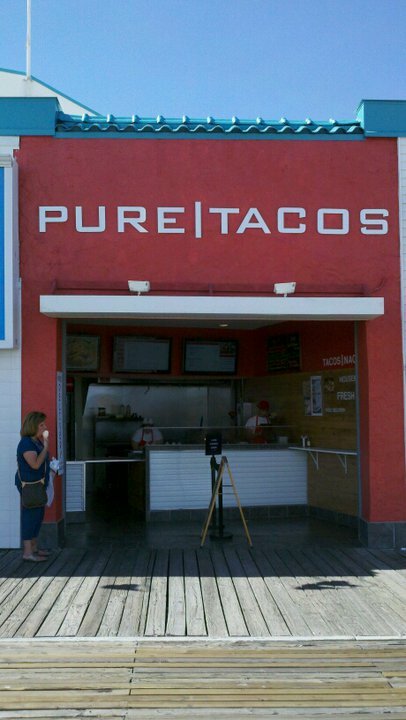 The next time I am up at the Shore, Pure Tacos is definitely where I will get my lunchtime vittles.